The Law Firm takes pride in providing the highest quality legal services to a diverse and dedicated client base. 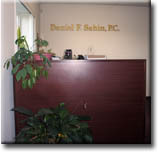 Our ultimate goal is to be proudly called your lawyer. We vow to be a reliable source for legal counsel and a place where you can be sure your interests always come first. Though small, our offices are equipped with state-of-the-art technology making our small rural offices competitive in today's technology based legal environment. Our offices are conveniently located in Central New Jersey on the Interstate 195 corridor, just two minutes from Exit 16 - the Six Flags Great Adventure Exit. We are in close proximity to the vast majority of New Jersey's State and Federal Courts. Initial consultations are FREE.